Messiah the card game is available for sale online right now! Messiah is a family friendly card game with a blend of skill and luck and a surprize ending. A game can last 15 to 45 minutes. Messiah cards include scripture from the King James Version of the Bible with blank spaces where words have been left out that the player can recite from memory to win a bonus card. Messiah is a card game for 2 to 10 players who are old enough to read (about age 8 and up). Messiah is suitable for parties, game nights, fellowship gatherings, or just hanging out with friends and family. This card game was designed by Laurene Wells in 2004, but just released to the public for the first time in 2009 through The Game Crafter beta online store. Laurene is owner of Heaven’s Blessings Tiny Zoo, a Christian game development company currently staffed entirely by volunteers. Messiah is NOT a computer game. 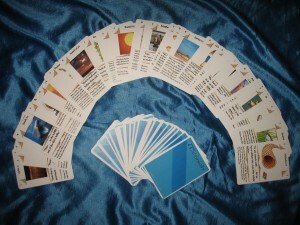 It is a regular card game printed on paper cards. Play it at the kitchen table!